321Soft Data Recovery for Mac is a full featured, complete data recovery solution for Mac OS X users to recover deleted, formatted and lost files from hard drives, USB flash drives, iPod, SD Memory Card, mobile devices, or any other type portable storage devices. 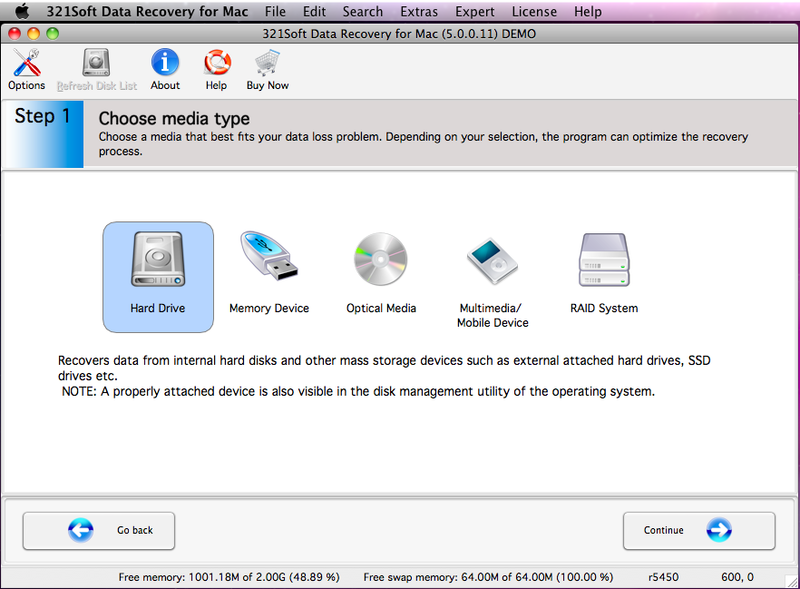 321Soft Data Recovery for Mac also includes a powerful RAID Reconstructor and a disk clone/imaging module. with intuitive and user-friendly wizard driven interface. ...... MP3, MP4 player and so on. 1) Choose a media that best fits your data loss problem. 2) Select a volume you want to recover data from. 4) Check your selected options and start the scan. 5) Select and save the files. An incredibly powerful hard drive data recovery utility to recover Mac data from accidentally deleted, lost, hard drive crashed, logical corrupted and formatted hard drive. Recover files even when your computer cannot boot up and cannot enter Mac or Windows.It also recovers formatted, lost partition, or damaged hard drive partition right on your Mac. Mac Data Recovery Software to restore mac data and recover HFS partition. Qweas is providing links to 321Soft Data Recovery for Mac 5.0.11 as a courtesy, and makes no representations regarding 321Soft Data Recovery for Mac or any other applications or any information related thereto. Any questions, complaints or claims regarding this application 321Soft Data Recovery for Mac 5.0.11 must be directed to the appropriate software vendor. You may click the publisher link of 321Soft Data Recovery for Mac on the top of this page to get more details about the vendor.